To celebrate Nissan’s 20-year involvement with the Gran Turismo racing simulator and the release of the latest Gran Turismo Sport game, the Japanese marque could have bought a Colin the Caterpillar cake from Marks & Spencer and invited a few friends to the local community centre for a game of pass the parcel. 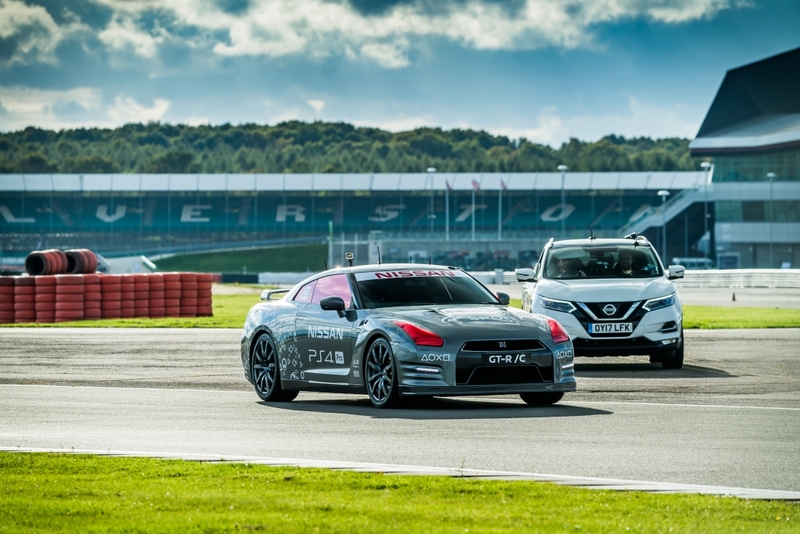 But that’s not how the forward-thinking brand operates so instead, it enlisted the brains of Dr James Brighton, head of the Advanced Vehicle Engineering Centre at Cranfield University, to create a fully remote-controlled R35 GT-R. The high performance vehicle has been fitted with four robots that operate the steering, transmission, brakes and throttle, while six computers are hidden in the surprisingly commodious boot to update the remote controls at up to 100 times a second. Said remote control is a completely unmodified DualShock 4 PlayStation controller and the user pulls the L2 left trigger for brakes, R2 right trigger to accelerate and gently thumbs the joystick for steering inputs. Sounds simple enough, right? 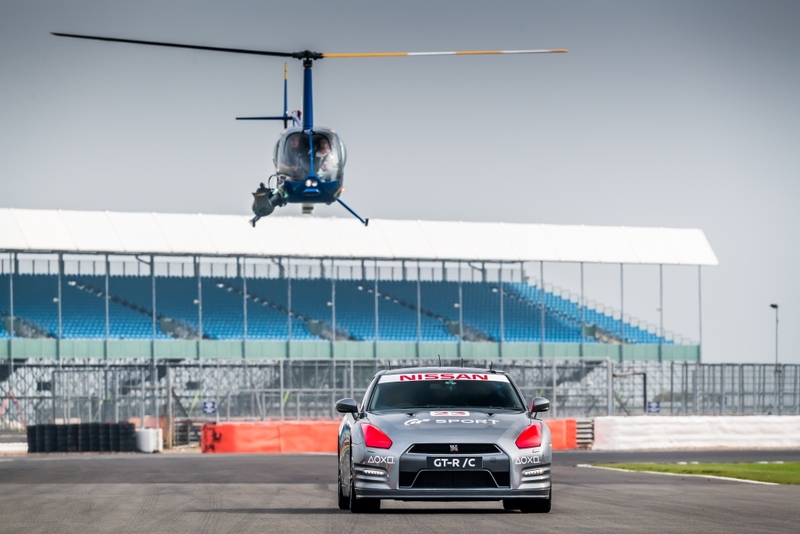 Well Flat-Out was let loose with Nissan’s ludicrously expensive creation at a rather blustery Silverstone circuit, just after GT Academy winner and NISMO driver Jann Mardenborough managed to coax it around the circuit at speeds of 130mph from the comfort of a Robinson R44 Raven II helicopter. Granted, we have some fairly dextrous thumbs but Nissan wasn’t quite ready to hang us out of a chopper just yet, so we got our first taste of the remote-control creation from the front seat of a Nissan X-Trail. Here, we were handed the DualShock controller and run through some of the main controls. Push up on the D-pad and the GT-R/C sat on the tarmac up ahead (see what they did there?) engages first gear. Push down on the D-Pad and it engages reverse. Nudge the thumb sticks left or right and the wheels of the 542bhp 3.8-litre V6 beast twitch in their arches. It’s eerily like controlling a Tamiya Grasshopper but one that’s 100-times larger and 5,000-times more expensive. Once vaguely familiar with the controls, we are told to release the brakes via the left trigger and squeeze on some gas with the right index finger. The GT-R/C picks up pace with surprising rapidity and it’s not long before we reach our first sweeping left-hand corner. We will admit now that we are on an oval circuit somewhere in the Silverstone complex, as opposed to the full International track, but there are plenty of tyre walls, cones and photographers to plough into should we dramatically balls up. And dramatically ballsing it up seems fairly easy, as the steering inputs are hyper sensitive, with even the slightest nudge sending the front of the GT-R/C twitching like mad. It’s also really tricky to judge distances and speeds when bobbing and weaving behind in the roly-poly SUV support car, so I naturally pile on the gas only to have to brake sharply at the next corner to avoid sending Dr Brighton’s work into a grass bank. 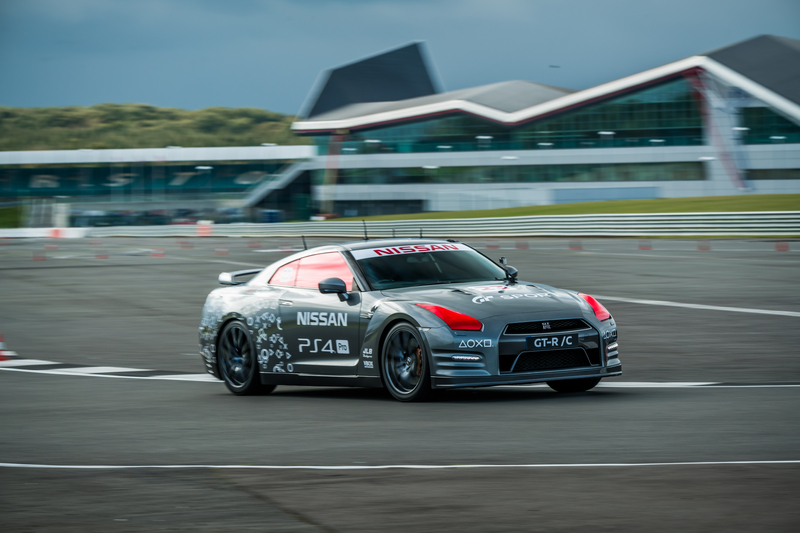 “The GT-R /C presented some unique challenges and a number of engineering firsts for us,” explains Dr Brighton. “We had to ensure the robotics would operate effectively during fast acceleration and deceleration, as well as high cornering g-forces. 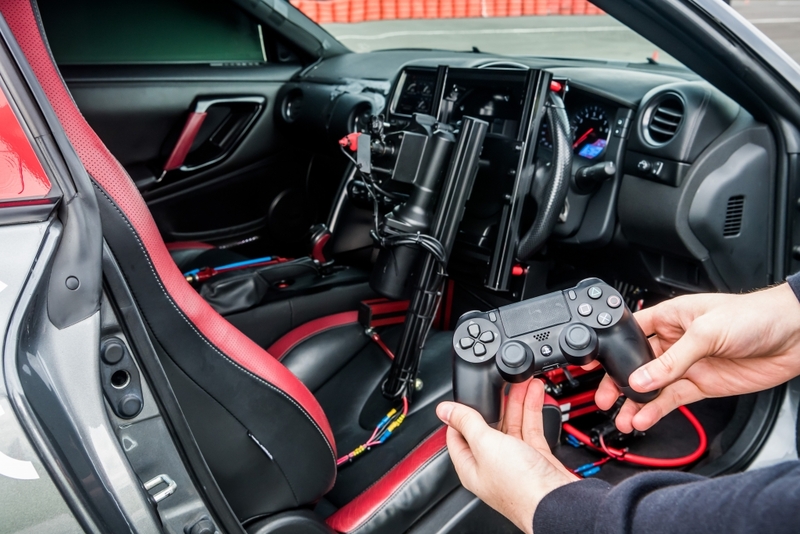 “Plus, it had to deliver realistic and reassuring control of the car at all speeds and maintain a robust connection between the car and the DualShock4 over variable distances and with minimal latency in robot response times,” he adds. We can confirm that it all works remarkably well but it’s certainly best left to the professionals. You can watch Jann show us how it is done properly in the video below.